Fly Fishing for Steelhead with a double handed Spey Rod has become a "Bucket List" thing to do in an Angler's life. Mike Sturza's Fly Fishing Guide Service has been guiding fly fishermen to catch Steelhead with all levels of fishing and casting experience. Through guiding and working with his customers Mike has learned that many people want a "Learn to Spey Cast and catch Steelhead Package". An A-Z package that starts at the beginning and teaches the student the basics of Spey casting not on the river but at a private user friendly casting pond. The Day 1 - Instructions begins with a basic on getting to know your eqiupment, (if you don't have a rod, it is provided). Then out to the casting pond for a step by step demonstration, where the instructor shows you how and why each spay cast is used.. Casters will learn the double spey, circle spey, snap-T, single spey, perry poke, and more. The class will also cover casting sink-tips, practical casting applications, and how to swing flies with a two-handed rod. After this instruction, the student is encouraged to practice on the casting pond by him/her self. This complete day one of the two day package. Note: This is a two day instruction, but it does not have to be done consecutively. The student is encouraged to come back and cast for free on the casting pond as many times as they want. Questions and Answers are free. 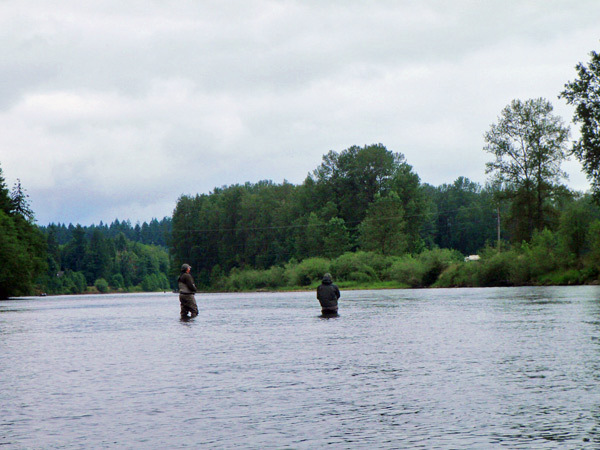 Day Two - A half day guide trip on the Cowlitz River. Here the student puts the casting instruction into real use. Again the instructor will demonstrate each cast and problem solve casting solutions to any difficulties that occur with each individual. Learn about drag and playing a Steelhead (maybe even hook into one) Fly Rod Playing Angles - different with long Spey Rods. After this package Steelhead students are given a 15% off coupon for any following full day guided trips.